Denny Jump (Bellevue, WA, United States) on 8 December 2011 in Lifestyle & Culture. Yuengling produces about 2.3 million barrels annually, which as of 2005, placed it sixth among American commercial breweries. Besides its two Pennsylvania facilities, Yuengling also operates a brewery in Tampa, Florida. Yuengling is pronounced "ying-ling," and is an Anglicized version of Jüngling, the German term for "young man". The family-owned brewery has traditionally changed ownership through the purchase of the company by the offspring of the previous owner. 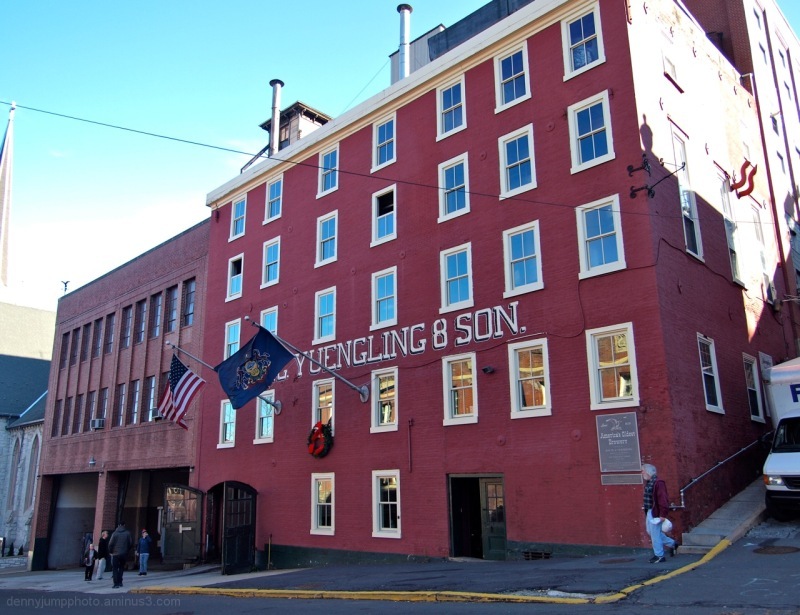 Due to the popularity of Yuengling Traditional Lager in Pennsylvania, it can be ordered by simply asking for a lager, especially in eastern parts of the state. Excellent historical commentary Denny. By-the-way, we will be spending the Christmas holidays on the east coast (Maryland). As I'm wandering around, I'll be on the lookout for the Yuengling brand. Breweries were such solid no-nonsense buildings back then . . today, it seems fashionable to put all the working parts on the outside ! @Ronnie 2¢: I quite agree...I was quite surprised, myself, at the truly utilitarian nature of this brewery and the compactness! Really interesting information, I would never have guessed the German connection. Wonderful establishing shot, Denny. Look forward to the tour! It is a wonderful building to go along with its history and product. This is an informative post, Denny, and I congratulate you on the successful wagon riding! I was always a social drinker (of course drank my face off in the late teens early twenties years) and many years in rock bands afforded me chances to imbibe, but back in 1997 when I became owned by a bank via mortgage, I decided to stop entirely for three years. Easy because I had never needed the stuff, and after I resumed again it has come down to just my trips to Victoria where I visit family as my one time to have a few. Good on ya, Denny! @Rick: Thanks Boss...APpreciate the support and I truly admire and salute you too...The music and artistic world are NOT easy places to regulate oneself in when it comes to these factors...I salute you again ;-) ANd, as I mentioned, I have so much s**t left in me I am on a natural high all the time anyway - it all comes down to how you think and how young your mind is...I still think of myself as a kid and I love it that way! It's a tidy looking place and it sounds like they have a lot of fans. A fine looking shot. Lovely colors of biulding, nice processing ! Such an appealing shot. Love the way this building hugs the hillside. By the way, hats off for 21 years sober...may you have many more !!! Good solid industrial foundation with 64 windows (if I'm counting correctly). You might like to suggest they call their next brew Windows64, they might get away with it. I was hoping they might have brewed beer.........., oh it's no good Denny, you'll have to take a trip over here. Hang on a minute, is that a Temperance church next door? @Curly: "Good Eye," Curly! It is very likely not a Temperance CHurch per se, but it is definitely a CHurch...I forgot to see what variety....probably Episcopal - they drink like fish! Great capture of the brewery, love the rich color on the building. Hi Denny, Great shot! Congratulations on 21 years. That is very special. I commend you for that. AH, your blog is always a worthy read, Denny, and you never disappoint. Great narrative about this place, your family and your own history. A child of the sixties, myself, I understand, and appreciate that you take your sons and grandsons to the traditional places.. Interesting history, Denny. Congrats on your 21 years! Congratulations on being sober for 21 years!! !